Danish health & fitness supplement suppliers, PurePower, enlisted the help of Westbury Packaging to produce new, high impact, shelf-ready packaging using lightweight Kemilight board. PurePower approached Westbury Packaging looking for a new point of sale packaging design that would help to enhance their product rebranding and allow easy transition from the warehouse to the shelf. The health & fitness company, who were in the process of redesigning their product look and feel, gave Westbury Packaging their original flapjack box and asked them to come up with a solution that would improve the box’s structure so it would withstand transit and fit a variety of products, whilst incorporating the new bolder look. 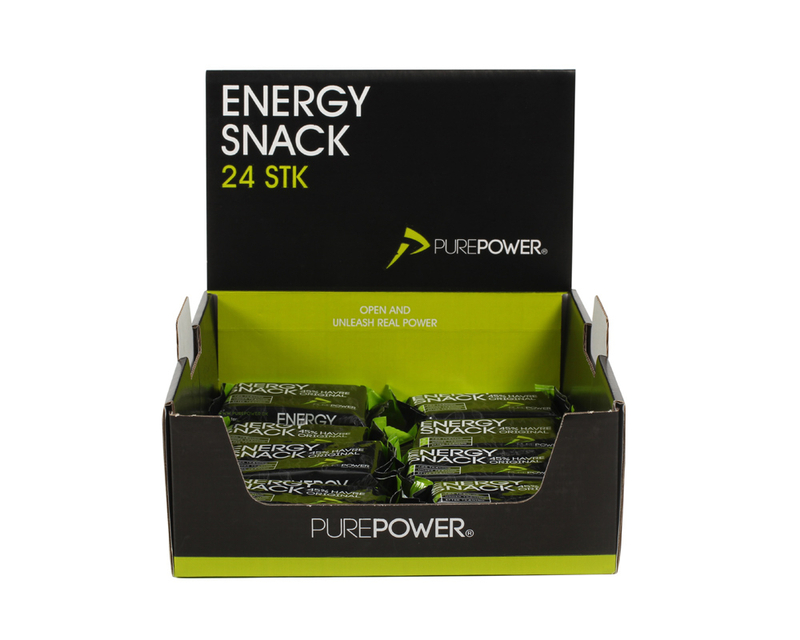 PurePower’s original generic “Energy Snack” packaging was not well suited to fit all of their bars. The company also found that the boxes had to be packed twice – once for shipping and once on arrival – making this a time-consuming and costly process. The uncoated surface of the original boxes was of low quality, resulting in a flat, low-impact finish. The design was also outdated and didn’t match up with the new theme that was being rolled out across all the PurePower products. Westbury Packaging chose to upgrade the PurePower energy bar boxes to a Kemilight coated board. Kemilight is an excellent lightweight solution that’s secure and sturdy for customers with delicate products, in particular those who want to ship and store food produce. With 100% pure fibres, it is perfectly safe for food products. Add to this another major benefit of using Kemilight, which is the fantastic print quality. As it’s a board with coated liners, during the flexo print process, the ink sits on the surface and doesn’t soak in to the material. There is low washboarding and the coating enables fast ink-drying, restricting the amount of ink absorbed even further. All these benefits result in a box which is more attractive and impactful to the consumer, thereby increasing product sales. PurePower’s new brand design incorporated a high percentage of dark and bold colours which, on regular corrugated board, are absorbed into the material and risk leaking into one another, losing their sharpness. Using Kemilight board now ensures the best possible print so that PurePower’s brand colours are “lifted” and the box stands out nicely from the crowd. 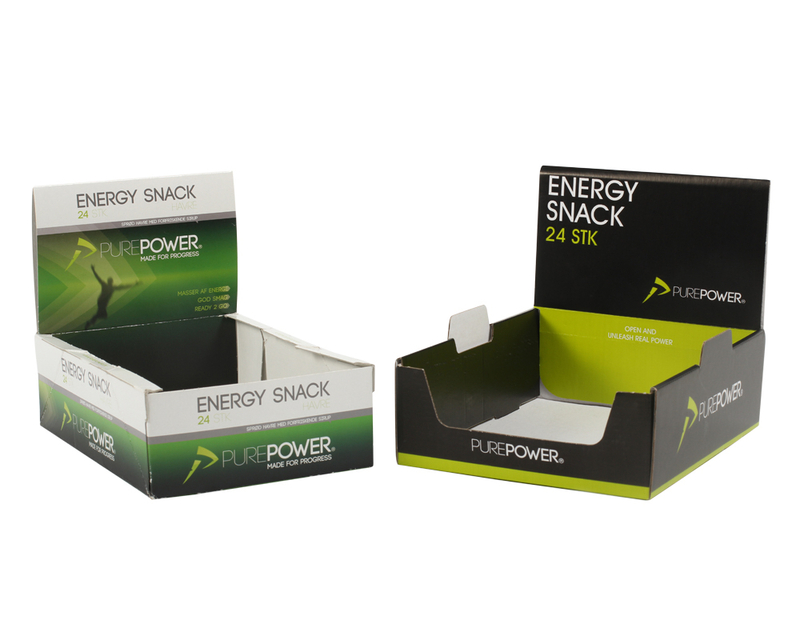 Westbury also improved the box’s structure to a more user-friendly design which is now able to accommodate the full PurePower Energy Snack range. The new design enables quicker stock replenishment and is favoured by retailers – the boxes can be packed with product before despatch, folded down during transit and then folded up again before going on display, revealing neatly fitted products inside. PurePower are a dedicated health & fitness sport practitioner brand based in Denmark. They create and distribute products and supplements that help maximise exercise and training progression. Their products, consisting mostly of protein shakes, energy snacks and gels, are all tested by experienced sportsmen and women and can be found in most major health retailers and online stores. If you would like to know how Westbury Packaging can help your business, please contact us.